Two words...Cooking Mama! 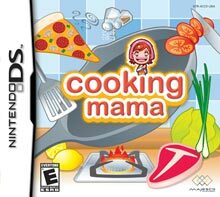 When giving your mother a Nintendo DS and a copy of Majesco's Cooking Mama, make sure to enforce the point that this does not mean that she could use some cooking lessons because eating the food she's cooked is akin to swallowing gravel. Just tell her that you wanted to give her something to make her day that much brighter, that much more full of life, laughter and fun. Then end your warm hearted gift giving with a, "Now get in the kitchen and make me a sammich!" and watch hilarity ensue.